The project still doesnt check if user had imdisk installed prior to build, It only tells you that you need imdisk installed when the build process gets to the PEFactory and tries to build a ramboot. Ramboot is on by default. When the user is informed that they need to have Imdisk installed. They are not given the location of where to get imdisk so they can install it. May when the user is told about not having imdisk installed. a popup can direct the user to where Imdisk can be downloaded and installed. Maybe have imdisk uploaded to the Reboot download section. Maybe have a way where when the build process hits the PeFactory Script . If there is no Imdisk installed. Ask the user if they which to install it. After install. Have a way where the user can continue finishing the Single run of the PeFactory to build the final ISO and run it in a virtual machine if one is selected. That way a user will not try to find imdisk to install. The user will be mad at this time. Then they will be mad that they will have to restart the whole building of the project because they dont know that they can just run the PeFactory script in order to finish the build once Imdisk has been installed to the PC. Virtual Box is selected as default. Someone might not have it installed. When building two Ram Images are created on Host computer but they dont seem to be auto dismounted after finishing build. When booting up. I get the following error. In my previous multiPE tests, I used MS Ramdisk driver. Yes, the raw image is not dismounted. I guess this is an opportunity for the user the examine and save the contents of the multiPE build. I added a script which runs as very first in a build. It checks, whether for the actual configuration required applications / drivers are present. If not, it gives a message and exits the build. Further mounted RAM drive: That happens, when the build is stopped with an mounted RAM drive. I'll try to unmount in such case. I cannot reproduce your txtsetup.sif issue. Please give me details about your host OS etc. The error message is the same as reported by TheHive. He attached an image displaying the error message. I received the same txtsetup.sif error message with the previous version of multiPE to build MultiPE_XP. I add manually MS Ramdisk drive to the build to fix the issue. You have cmd.exe in your host XP as shell? Or you defined in the project build? This is defined in the project build. Attached are my options screen and build log. I tried again and I got the same txtsetup.sif error message. 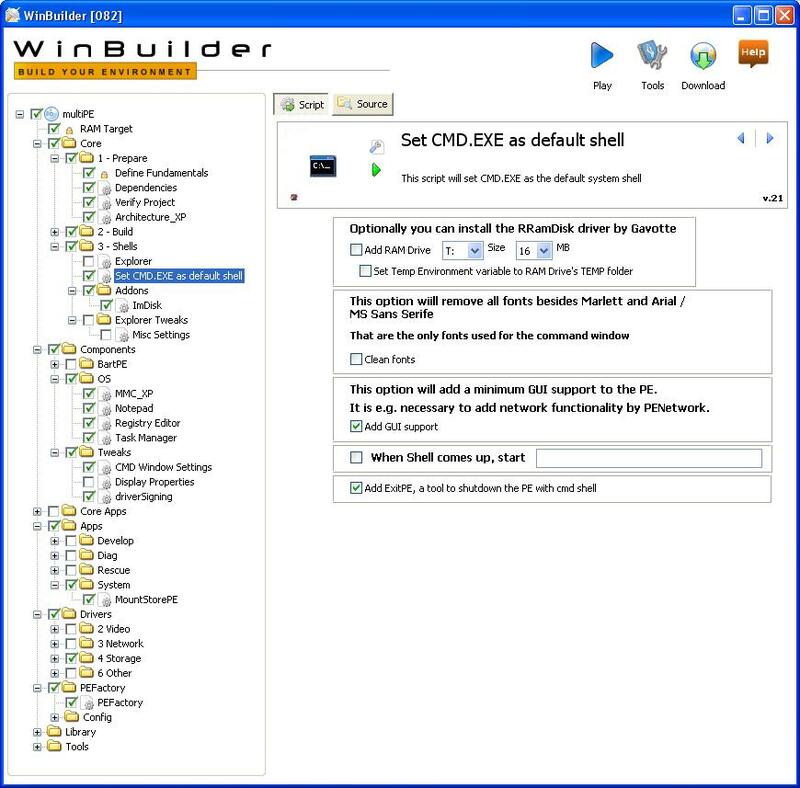 Viewing your screenshot displaying Winbuilder, I noticed that you are not using the multiPE package you offer in your website. For example, in your screenshot I see that the first script is Systemcheck while mine is RAM Target. To track the problem you and all other users must use the same package. Please correct me if I am wrong. TheHive got the same txtsetup.sif error message. Once again thanks for this new release and for your efforts. For example, in your screenshot I see that the first script is Systemcheck while mine is RAM Target. Sorry, that's my new additional script to avoid TheHives concerns about "If something is missing, we'll get to know very late in the build process"
Forget it for the current issue. The script is ONLY RUNNING, it does not change anything in the build! I think that there is something else depending on your CD which makes the troubles. Maybe it is only 99 percent legal, but tomorrow I PM you a copy of my CD. Try that. Thanks for your support. Interestingly, I am never able to boot a multiPE_XP built using ramdisk as Winvblock. I receive the same txtsetup.sif error message or a BSOD. Replacing the Winvblock driver with MS ramdisk.sys is solving the problem. I don't know why the Winvblock driver is an issue. Interestingly, I am never able to boot a multiPE_XP built using ramdisk as Winvblock. I receive the same txtsetup.sif error message or a BSOD. Replacing the Winvblock driver with MS ramdisk.sys is solving the problem. I don't know why the Winvblock driver is an issue. In PEFactory > Config > RAM Boot you can use FiraDisk as alternity. Try that. Any idea why with the same build WinVBlock works on mayn systems, but fails on some systems? I think I solved the mistery. Checking my archive from 2009, I saw that a LiveXP built using Firadisk was using a patched ntldr. If am not wrong, multiPE does not patch the default ntldr file and this is why I get the txtsetup.sif error message. Replacing the default ntldr file with the patched version extracted from a LiveXP build solved the problem. Could you check your ntldr file in your multiPE_XP iso? The wrong path information is causing the problem if I am not wrong. When setupldr.bin is read only, the patch fails. In my multiPE_XP built configured to run cmd.exe as default shell, the imdisk script is activated. EDIT : iernonce.dll needs to be added too. Thanks for the new upload. I tested with the same configuration ( cmd.exe as default shell ) and it works fine. Thanks for the RunOnce functionality to cmd shell in the latest upload but it didn't work for me and the imdisk based Ram disk does not appear again. Do I miss an extra setting to configure the RunOnce feature? Sorry, I missed that setting. This time I received the error message : Error loading iernonce.dll - the specified module could not be found. I suspect that you are trying to update files in an existing customised WB project with new multiPE downloaded files. Try the other way: Build a new WB directory with a freshly downloaded multiPE, and then do your changes. Sorry, in my two attemps with freshly built WB directories, I got the same error message : Error loading iernonce.dll - the specified module could not be found. I have the latest multiPE package.